... just a calvacade of remarkable gambling moments, with commentary from Al Michaels, Art Schlichter and Larry Merchant, plus live reports from Jack Price (standing in front of a green-screened picture of the Mirage in Vegas). Every fifth episode we'll even hold séances and try to contact the late Pete Axthelm, because nobody would have loved this show more than him. You may think you lost, Chris, but there are thousands of gamblers who think you're a winner. Why am I mentioning this? Because the show about Chris Duhon's one-legged 35-footer probably runs as the pilot episode. Maybe you missed it on Saturday night. Trailing by three with 2.9 seconds to play, Duke fouls Emeka Okafor, a terrible free-throw shooter. He misses the first ... but makes the second. Game. 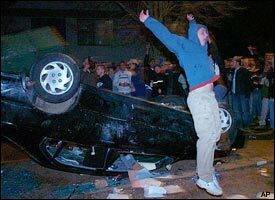 The UConn players start celebrating. Duke inbounds the ball to a crushed Duhon, who halfheartedly dribbles past midcourt and launches a "What the hell?" moonshot at the buzzer. Off the backboard ... and in. Throw in Duke blowing that big lead, followed by UConn rallying back, then Okafor bricking that first free throw but improbably making the second ... and then Duhon hoisting that last-second 3-pointer like a depressed little kid whose Mom is screaming at him to come into the house ... I mean, this one may never be topped. I can't even imagine what the sports books in Vegas were like. Personally, I would have ended the Tournament right there. But since they decided to play the championship game -- UConn giving five to Georgia Te-, um, I mean, UConn playing Georgia Tech -- I couldn't help but keep a running diary. 6:00 p.m. PT -- We're coming to you live from the Sports Guy Mansion! I'm here with my dog Dooze and one of those coffee frappucino thingies from Starbucks. I think it's a venti.. But you can't be too sure. More importantly, how did San Antonio get the Final Four? Is it a rule that every major sporting event has to be held in Texas this year? Have we been invaded by Texas? Is that why they have their own flag? I'm brimming with questions tonight. 6:02 -- CBS brings us the "Prelude to a Championship, sponsored by American Express!" In other words, it's a pregame show. 6:04 -- During an interview with Bonnie Bernstein, Tech coach Paul Hewitt has a "What's up, baby?" glow about him. 6:08 -- For some reason, CBS shows us Jim Calhoun's pregame speech to his players. It was just like Norman Dale's speech at the end of "Hoosiers," except for, well ... every single moment. 6:09 -- "The best player on the floor is Emeka Okafor," Clark Kellogg tells us. 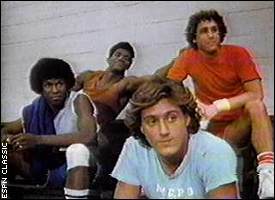 You mean it's not the center on Georgia Tech who looks like Salami from "The White Shadow"? Luke Schenscher participates in a pregame workout. 6:11 -- I'm never buying Papa John's again. 6:12 -- According to Greg Gumbel, it's Billy Packer's 30th consecutive year announcing the Final Four. I was watching the Bird-Magic Marathon on ESPN Classic two weeks ago -- of course I was -- and before the DePaul-Indiana State semifinals, NBC showed how Indy State fans made up T-shirts ripping Packer because he had been dismissing their undefeated team all season. Then, after Indy State won the game, Larry made one of those "I thought we weren't supposed to be here"-type jokes as Packer laughed uncomfortably. Keep in mind, this was 1979 -- a full 25 years before Phil Martelli and St. Joe's. I'm sensing a pattern here. Maybe I'm nuts. 6:16 -- "CBS's exclusive coverage of the men's national championship game is brought to you by ... XCingular Wireless! Troy! Coca-Cola! And by the new Chevrolet!" 6:20 -- They're introducing the starting lineups ... the role of Emeka Okafor will be played tonight by Taye Diggs. 6:22 -- According to Jim Nantz, "Tonight's game is brought to you in HDTV by Harris Corporation." At this rate, every company in America will be plugged by 7:45. 6:23 -- Our referees tonight: Richard, Verne and Randy. We should never know their last names. It should be like the "Real World" or "Survivor." 6:28 -- You know, I think I'd pay $2,000 to hear Mike Tyson try to say the name "Luke Schenscher." 6:30 -- Heading into our first TV timeout, it's 9-7, UConn. We've already seen 15 missed shots, a goaltending and a charge. I'm having my first "LeBron and Carmelo should be here" pangs. 6:33 -- As we sit through the 5,000th "Without a Trace" promo of the past three weeks, how 'bout a moment of silence for "Century City," this year's "Token Crappy March Pilot From CBS" that couldn't even make it through the Tournament without being cancelled? Geez, even Falcone and Baby Bob made it past the title game. 6:36 -- Clarence Moore is at the foul line ... he majors in "Management." Eventually he hopes to manage people and stuff. 11-10, UConn. Salami, er, Schenscher couldn't handle Okafor. 6:38 -- Our second horrible call of the game -- Salami just blocked a three, got all ball, and they called it a foul. Only 35 more inexplicable calls to go before we approach Saturday night's Duke-UConn game. 6:40 -- Now Ben Gordon is at the line ... he's majoring in "Pre-Business Administration." Eventually he hopes to administrate some things. He makes three of three. Timeout on the floor -- UConn's up four. It's about to be 15. 6:41 -- Wow! It's a Steven Seagal sighting! He's pimping Mountain Dew and apparently coloring his hairline in with a Sharpie. Did you know that he's widely regarded as the biggest jerk in Hollywood? Apparently nobody else comes close. And this is a city where nobody can agree on anything. A) "Cold Case" and "Without a Trace" merge into "Without a Case"
B) The much-anticipated premiere of "CSI: Hartford"
C) They're showing a "Two And A Half Men-A-Thon"
D) On a very special "Hack" -- to catch a terrorist, Hack has to become a terrorist. 6:43 -- You know, out of all the sideline cams out there, I think the Dasani Sideline Cam is my personal favorite. And yes, I'm distracting you from the fact that UConn just rolled off a 10-0 run. Will anyone read a diary of a 30-point rout? We're about to find out. 6:47 -- From Packer: "There's something really interesting in regard to Connecticut from 3-point shooting -- they shoot 41 percent from 3, Georgia Tech guards 3-point shooters at the rate of 29 percent, so again, something has to give in that statistical matchup." I'm on the edge of my seat, personally. 6:48 -- Just won my "Salami will get double-teamed on the low post and awkwardly lose the ball" first-half prop, which I had parlayed at 15-1 odds on Saturday night with "Jimmy Fallon and Horatio Sanz will crack up in the same SNL sketch." Easy money. 6:49 -- On a twisting lay-up by Taliek Brown, it's suddenly 28-16, UConn. Let's go to Harold Lederman and see how he's scoring the game. 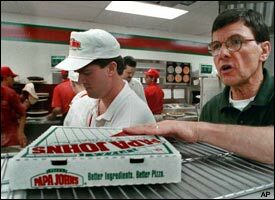 6:51 -- I guess the question is this: How would you feel if you were a college basketball announcer and you DIDN'T have a pizza commercial? You're not officially a college hoops analyst until Papa John's comes calling. 6:54 -- According to Packer, "When you're playing a team like UConn, you want them to play your game, not their game, and so far, right off the bat, Connecticut got Georgia Tech to play their game." 6:54 -- Big offensive rebound and putback by Josh Boone, one of the most impressive freshmen this spring. Every time a team wins the NCAAs, there's always a hot freshman lurking somewhere. UConn by 12. 6:54 -- Okafor challenges a G-Tech shot and forces a brick, leading to a basket at the other end. See, this should be kept as a stat -- when you alter a shot that leads to a miss and a quick basket; just like they should keep track of every great pass that directly leads to a layup or dunk. I feel very strongly about this. 6:56 -- Of course I'm rooting for Boston Rob. Like you had to ask. 7:03 -- "Somebody once said, 'Everyone will get 15 minutes of fame.' Some insurance companies seem to think that that's all you need. But at Allstate, we think 15 minutes may not be enough. That's why they'll take as much time as you need, to make sure your insurance coverage is right. You deserve more time in the spotlight. That's Allstate's stand. Are you in good hands?" 7:09 -- With 90 seconds left in the half, Packer tells us, "Very important right now, 12 points down, for Georgia Tech to get good looks." I think I'm developing another eye tic. 7:13 -- Tech clangs two free throws, then allows a long two at the buzzer. UConn heads into the half leading by 15. They're running the floor, hitting threes and forcing G-Tech to take bad shots. There's absolutely nothing else you need to know about this game. Nothing. More importantly, "CBS's exclusive coverage of the men's national championship game is brought to you by ... Miller! DiGiornio! The Hartford Mutual Funds! And ... by Mazda!" 7:18 -- Hey, couldn't Charlie Villanueva perform some "Midnight Oil" songs at halftime? 7:23 -- Well, folks, I have some news. Hope you're sitting down. The 1983 Title Game (N.C. State-Houston) just won the XCingular "Greatest Game Ever" Contest. And it wasn't just because of the ending ... it was because Guy Lewis kept Clyde Drexler in the game in the first half so he could pick up his fourth foul. Villanueva pumps up the halftime crowd with a liitle Midnight Oil. 7:26 -- Just spent some time flicking channels ... not only did the Indians blow a four-run lead for one of my roto pitchers (C.C. Sabathia), but Julie the Mormon is challenging Coral to a wrestling match on the "Real World-Road Rules Challenge." All hell is breaking loose. Can they fight to the death? Please? 7:34 -- Time for the second half. "CBS's exclusive coverage of the men's national championship game is brought to you by ... Putnam Investments! Microsoft! Bud Light! And ... by Pontiac!" 7:37 -- You know, Okafor reminds me of Alonzo Mourning and David Robinson -- maybe not the same scorer, but a similar shotblocker and rebounder, and a smart guy to boot. And he has GREAT hands. And he comes through when it matters. So unless scouts are 100 percent convinced that Dwight Howard is more Duncan than Kwame, and unless you're the Hawks or Bobcats and you can wait a few years, you have to take Okafor at No. 1, don't you? How can you not? How many Darko-Carmelo situations need to happen? Shouldn't you always go for the Sure Thing? Always? 7:41 -- During a montage of Okafor-Salami highlights, Nantz actually says, "Some have said (it's) the best battle of big men in a championship game since Ewing and Olajuwon." Somehow he doesn't get hit by a lightning bolt. 7:44 -- Hey, if CBS can call itself "America's Most-Watched Network," does that means ABC can start calling itself "One of America's Most-Watched Networks"? 7:52 -- UConn by 25. Hewitt officially looks like the South Bend High coach at the end of "Hoosiers." 7:55 -- Packer: "This has been a brilliant NCAA Tournament -- the final game will not be indicative in any way shape or form about how Georgia Tech played, or for that matter, how the Tournament has been played. Total dominance by Connecticut." 8:02 -- Nantz tells us that Ben Gordon was born on the same day N.C. State beat Houston in 1983. We're officially on Page 9 of CBS's "Garbage Time Notes" pamphlet. 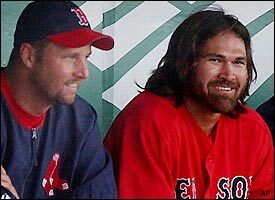 Johnny Damon discusses his plan to star in "The Passion II: I'm Back!" with Tim Wakefield. A. Fourteen kids for Calvin Murphy? Fourteen? By nine women? All in the Houston area? Can we start keeping track of this stuff? More importantly, was this why they called him "The Pocket Rocket"? B. If the Sox lose out on another World Series with Christ playing center field, it's clearly not happening in my lifetime. C. I thought it was a nice moment when the girl won the high school slam dunk contest last week. I really did. It reminded me of the Simmons Family Softball Game back in the early '90s, when my cousin Carrie always insisted on playing even though she was a little kid, so we would let her swing the bat and make contact, and then my Dad would throw the ball over my Uncle Don's head so Carrie could get on first base, and she would think she got a legitimate single. She was like eight. The point is, you need to do these things sometimes. And there are people out there who apparently need to believe that a woman can win a slam dunk contest. So let's give this to them. Join me as we collectively throw the slam dunk trophy over my Uncle Don's head and allow Candace Parker to reach first base. Nice hit. 8:04 -- Wait a second ... G-Tech just rolled off a 10-2 spurt ... now they're down by 17 with just under 9 minutes to play. Undaunted, Packer tells us, "This game has been over for some time." Didn't he rule out a Maryland comeback against Syracuse two weeks ago? And isn't UConn a horrendous free-throw shooting team? 8:12 -- With UConn slowing things down and killing clock, Packer says "The object is to win the game" for the third time in six minutes. 8:17 -- Okafor is abusing Salami. Just killing him. This is like Hakeem Olajuwon against Sue Ellen Ewing. By the way, I agree with Packer -- gulp! 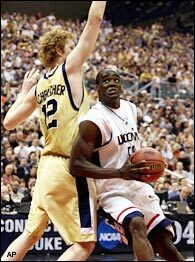 -- why isn't G-Tech fouling the UConn guys when they have some terrible free-throw shooters? Why would Okafor ever be allowed to shoot in the low post? Mystifying. 8:20 -- Suddenly Tech is down by 11, 2:40 to play. Please ... please ... if there is a God ... I'd even sacrifice my UConn-A's-Indians three-team parlay tonight just to see Tech make this interesting. 8:33 -- With 20 seconds left, Will Bynum misses a three that would have cut it to six. Damn. At least we made Packer sweat a little. "One Shining Moment," cutting the nets down ... but it isn't a celebration until cars are turned over. 8:35 -- Nope. Our final score: UConn 82, G-Tech 73. Okafor hasn't been this excited since he gave Stella her groove back. By the way, he posted 42 points and 22 rebounds in his last three halves of play. And he shouldn't be the first pick? Really? 8:44 -- During the postgame interview with Calhoun, Packer squeezes one more "The object is to win the game" reference. Too bad Joe Theismann isn't here to add "Great players make great plays." 8:56 -- And now it's time for another episode of "One Shining Moment." I'm just waiting for one of these years when they accidentally show the video from like seven years ago, only nobody notices. I can dream.